Craft House Salon— Single Process - All About Covering Those Suborn Grey's! Single Process - All About Covering Those Suborn Grey's! The what, the why and the when. So, what exactly is a single process? (Also known as gray coverage or root touchup). A single process is a color service that is done in one single step: applied, processed, and blown dry. Bing, bang, boom—it’s done. Most often, we use is to cover those ever emerging grays that won’t stop coming. But it is also used for anyone wanting a permanent all-over change or highlights, and don’t want to be bleached and toned. A single process touchup is used to color that pesky little line of natural hair (and yes, gray is natural) that we start to see creeping out every four weeks (sometimes two to three). That little hair strand may seems larger than life, yet it is both a blessing and a curse. Our hair is growing, and back to the salon we go. There is a reason we request you to come back for a single process touchup within four to six weeks. Why is this, you may ask? KERATINIZATION. This is the process that when hair grows, it continues to harden. The hair closest to your scalp is softer than the hair grown out half an inch. The harder the hair, the more difficult for the color to penetrate it. Now, what happens when you wait too long to get your single process touchup done (longer than six weeks—and six weeks is pushing it), it creates banding. Banding is usually lighter and has break through gray or natural color showing, more transparent than what is closer to the scalp. This means the color would then have to be reapplied to get proper coverage. To avoid banding from happening, your stylist has to formulate and/or apply different products. Because this takes more time and product, it will be more expensive for you, the guest. So “stretching color” in theory might spread out your appointments, but your color will not be as consistent and the procedure will be more expensive. When your stylist tells you they want to see you in four to six weeks, it is for a good reason. Doing color in the proper timeframe results in an even, balanced, and beautiful hue. You get that perfect shade without having to be there for added time or money, and know that it will be consistent and accurate every time. Not everyone is lucky to be four to five weeks out when the grays start to emerge, and we understand it can be an unsettling sight for some people to see. 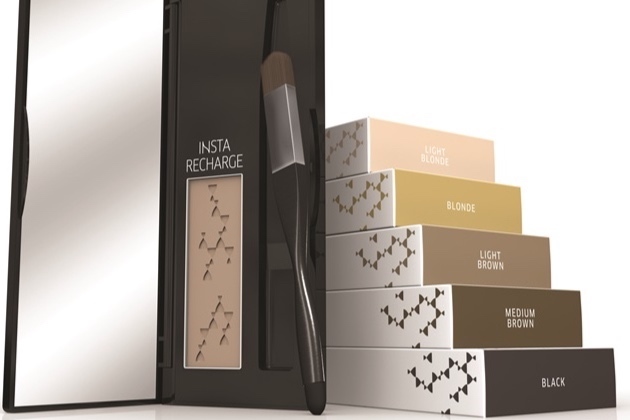 We recently just got in Insta Recharge by Wella ($25). It is a temporary root concealer, that comes in a sleek compact with a mirror and brush. It can be used in four different ways! Regrowth concealing, highlight extension, optical filling/thickening, and eyebrow definition. Available in five shade: Light Blonde, Blonde, Light Brown, Medium Brown, and Black. Curious? Want to see it in action? Stop in and give it a try, testers are available in all colors. We’ve had great feed back already! If this type of maintenance isn’t for you, we suggest discussing it with our colorist. There are a myriad of options for color to better fit your lifestyle.